Color Available: Red, Orange, Black etc. Heavy Duty C.I Bonded Wheel 14" x 2.5"
we are manufacturing solid rubber tyre size from 4 inch OD to 40 inch OD. We are engaged in providing our clients a qualitative array of Heavy Duty Castors - Fabricated, which are provided in different dimensions and sizes to suit the specific demands of our clients. With the assistance of our team of professionals, we are presenting our valuable clients an astonishing range of Double Wheel Puff Castor. These wheel castors are manufactured in our well equipped fabrication unit using best grade factor input and latest techniques. Our product range is known for its robust construction, reliable performance and durability. - Tube and tubeless type applications. - Single, two and three piece wheels available. - Disc wheels and De mountable wheels. - Hub and stud piloted. We are offering our patrons Heavy Duty Polyurethane Wheels, that are in vast demand in the markets. These wheels offer a smooth ride over rough surfaces. Our spectrum of these wheels is bonded to a high impact Polyolefin/Polyamide core, which is capable of removing the bond separation arising owing to wet conditions. 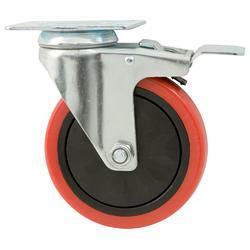 We offer wide range of Heavy Duty Caster Wheel which are designed and developed as per the International standards. 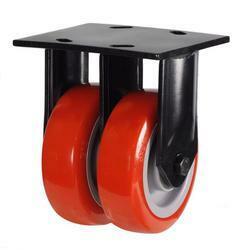 These wheels are available in various sizes and are very sturdy and their load carrying capacity. These can also be customized as per the specific requirement of our clients. These are in use all over the world if machining shop floors, or heat metal forging plants the excellent performance allows you to reduce you fuel and energy consumption enormous. the wheels assembled with our best components fabricated steel or cast iron hubs machined as per the latest specification of automobile industry. Wheel Size: 3", 4", 5", 6", 8"